This must be the week for blog giveaways. I don't know about you, but I love the chance to win FREE stuff. Here's three more chances to win. #1 Tanya, at First Grade is Fantabulous, is celebrating 200 followers. Check out her blog for your chance to win a $25 Amazon gift card. 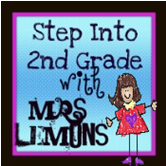 #2 Mrs. Lemons, at Step Into Second Grade, is hosting her first blog giveaway to celebrate 100 followers. She is giving away a super cute, customized t-shirt. Head on over to her blog to enter. #3. The Moffatt Girls is also having a giveaway to celebrate 300 followers. This time you could win an Amazon or Target gift card. Make sure you visit her blog for a chance to win.